St. Ann’s Warehouse is located at 45 Water Street, Brooklyn 11201 — next to the Brooklyn Bridge. From the Manhattan Bridge (Upper Roadway), continue onto Flatbush Avenue and make a right onto Tillary Street. Make another right onto Jay Street. Continue on Jay Street and turn left on York Street. Turn left on Front Street and right on Dock Street. St. Ann’s is on the corner of Dock and Water. From the Brooklyn Bridge, take the first exit onto Cadman Plaza West and bear right at the bottom of the exit ramp. Turn right on to Cadman Plaza West and continue to bear right when the road splits. Continue straight to merge onto Old Fulton Street. Turn right on Front Street. Turn left on Dock Street (immediately after you drive under the Brooklyn Bridge overpass). Follow Dock Street to the corner of Water Street, St. Ann’s will be on your left. Take the BQE East (I278E) to Exit 28A Cadman Plaza West. Follow the exit ramp all the way to the stop sign and turn right onto Old Fulton Street. At the first light, make a U-turn onto Old Fulton Street. Turn right on Front Street. Immediately after you drive under the Brooklyn Bridge overpass, turn left on Dock Street. Follow Dock Street to the corner of Water Street, St. Ann’s will be on your left. Take the BQE West (I278W) to Exit 28 for Cadman Plaza West/Brooklyn Bridge. Bear right at the bottom of the exit ramp and turn right at the exit ramp stop sign onto Old Fulton Street. Make a quick right onto Front Street, then a left on Dock Street. Follow Dock Street to the corner of Water Street, St. Ann’s will be on your left. Take the Holland Tunnel into Manhattan. Follow signs for Canal Street East. Take Canal Street to the Manhattan Bridge (Upper Roadway). From the Manhattan Bridge into Brooklyn, continue onto Flatbush Avenue and make a right onto Tillary Street. Make another right onto Jay Street. Continue on Jay Street and turn left on York Street. Turn left on Front Street and right on Dock Street. St. Ann’s is on the corner of Dock and Water. Click parking/car services for information on parking lots located near the Warehouse. We recommend using Google Maps to plan your trip via subway. F F to York Street – Turn right upon exiting the York Street station. Proceed down Jay Street and turn left on Front Street. Turn right on Dock Street. St. Ann’s Warehouse entrance is located down Old Dock Street in Brooklyn Bridge Park. A CA/C to High Street – From Manhattan, exit at the rear of the train. From Brooklyn, exit at the front of the train. Walk down Cadman Plaza West which turns into Old Fulton Street. Make a right on Front Street and a left on Dock Street. The entrance to St. Ann’s Warehouse is located down Old Dock Street in Brooklyn Bridge Park. 23 2/3 to Clark Street – Walk five blocks down Henry Street (toward the Bridge) and turn left at Cadman Plaza West. Cadman Plaza West becomes Old Fulton Street. Make a right on Front Street and a left on Dock Street. 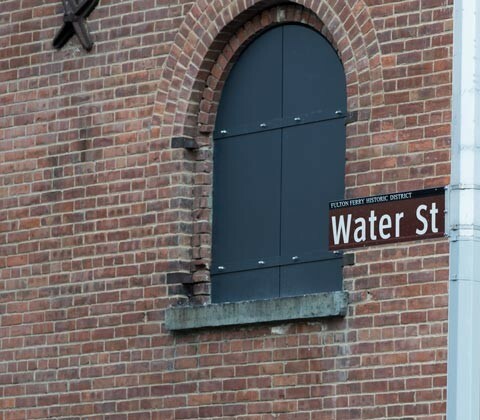 The entrance to St. Ann’s Warehouse is located down Old Dock Street in Brooklyn Bridge Park. Take the B25 to the corner of Water Street and Main Street. Walk west on Water Street. St. Ann’s Warehouse is located at the corner of Water and Old Dock Streets. *Please consult the MTA website for the most up to date information on possible route delays or changes. Take the footpath over the Brooklyn Bridge and turn left. The stairs feed into Washington Street. Walk north two blocks on Washington and turn left on Water Street. St. Ann’s Warehouse is located at the corner of Old Dock and Water Streets. NY Waterway operates the NYC Ferry to and from DUMBO. From the park pier, exit on to Old Fulton Street. Turn left on Water Street, which curves to the right. St. Ann’s Warehouse entrance is located down New Dock Street in Brooklyn Bridge Park.